Let’s get the most obvious points out of the way: yes, Darksiders II: Deathinitive Edition is sort of a dumb name, and yes, this is another remaster appearing on PlayStation 4. But hey, if you haven’t experienced the polished adventuring of this stellar title from last gen, this buffed-up version presents a great opportunity to jump in. If you have, well, you probably won’t find much here that makes this version worth dropping more cash on. Outside of, you know, it being “deathinitive.” We’ve heard of lamer reasons to replay worse games. If imitation is the sincerest form of flattery, Darksiders II butters up The Legend of Zelda like nobody’s business. From exploring the overworld on horseback to playing a little chime when solving a dungeon’s puzzle, this adventure owes a lot to Nintendo’s core franchise — don’t go calling it a clone, though! The game may follow the familiar beat of its inspiration: overworld, dungeon, overworld, dungeon; but the addition of RPG elements, as well as a much more acrobatic main character, take Death’s quest beyond the territory of mere imitation and into a realm all its own. 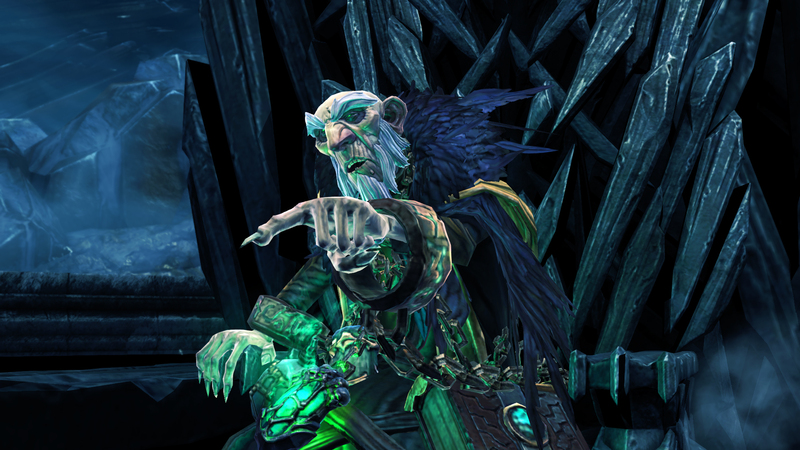 And what a realm — players who might otherwise be put off by the exaggerated character designs should know that Darksiders II plays as smoothly as any other adventure game out there. The extensive overworld is appropriately littered with monsters to fight, items to collect and quests to complete. The light role-playing elements go a long way to making all of this more enjoyable: there’s no dearth of stat-improving equipment to find, and crushing enough enemies earns you points to spend on new abilities via a skill tree. Controlling Death is a breeze, too; for such a hulking guy, he’s able to run along walls, clamber up cliffs and leap from one area to another with relative ease. Doing all this feels more natural and responsive than it does in many other titles with similar freedom of movement. Like those in the Zelda games, the dungeons here are built to test your abilities and showcase the best the designers have to offer. They strike a nice balance between puzzle-solving, exploration and combat, and they’re just long enough to be satisfying without overstaying their welcome. They’ve got the essentials of great stage design down, as well; elements introduced in earlier dungeons return in later ones, building on the initial concepts with added twists and layers. There’s something about this that just feels right, especially if you’re a big fan of the genre. For example, one early dungeon-specific item can be thrown at objects to cause an explosion, removing barriers and triggering switches. In later applications, an altered version of the same item allows you to trigger its burst remotely, playing off your knowledge of its previous use and expanding its puzzling options. 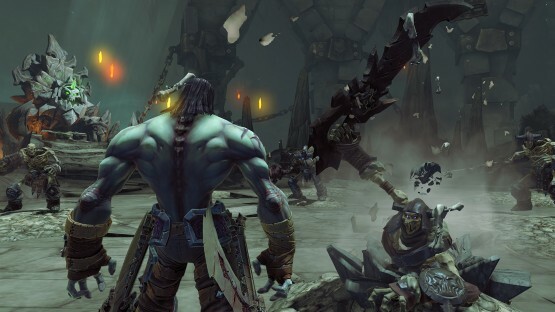 But this is a remaster, of course, so let’s get down to the nitty-gritty of that aspect: for a game billed as the “definitive” version of Darksiders II, these improvements feel awfully undercooked. Graphically, the game looks better than it did on PS3, but only just; while the rendering has definitely improved and the resolution of textures has been noticeably increased, the overall impression still brings to mind a game from last gen. That, and the performance issues found in the original version still persist — small framerate hiccups and a few wonky collision issues should have been addressed as part of this upgrade. Oh, and if you’re considering this version expecting to get all the included DLC right off the bat, think again; rather than forking it over immediately, the developers have elected to integrate the items as loot. That’s not the worst idea on its own merits, but it may confuse some players given their advertised inclusion. On the whole, this rather lackluster showing of “remastered” qualities doesn’t do anything to damage the original (great) game, but on the other hand, this underappreciated gem probably could have used an extra push from added content or a more-drastic visual polishing to appeal to a new generation of console owners. 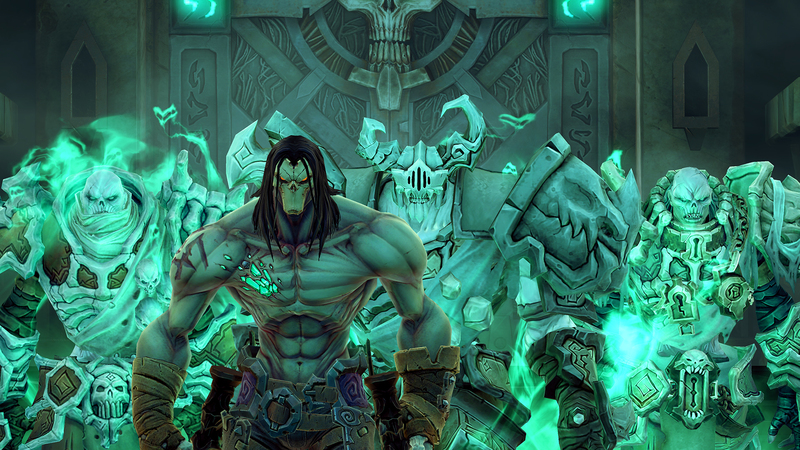 Darksiders II: Deathinitive Edition is best as a purchase for those who haven’t yet experienced the original version. The game remains a fantastic riff on adventuring conventions perfected by the Zelda series, and that it gets the imitation right is a compliment of the highest order. Still, the graphical upgrade here isn’t as noticeable as in other remasters, and the game remains a bit uneven in its performance. As a relatively underappreciated game from the previous generation, Darksiders II deserved a bit more in its revival to prove its worth on the PS4. Review copy for Darksiders II: Deathinitive Edition provided by publisher. Reviewed on PlayStation 4. For more information on scoring, please read our Review Policy here.